Open the can of white beans, pour off any excess liquid, and put the beans into the container of a high-speed blender. Add the nutritional yeast, lemon juice, corn starch, and some hot sauce (if desired). Cover the blender container and turn on the blender to "high", and blend all the ingredients thoroughly. Peel and wash the onion, and slice into thin slices. Split the crumpets in half, and place the halves on a microwaveable plate with the split sides up (the crumpet halves may be toasted first, if desired). Spoon the un-cheese sauce onto each crumpet half, and smooth out to the edges. 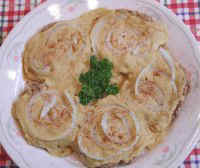 Arrange some of the onion rings on top of each crumpet half and sprinkle some paprika on top. 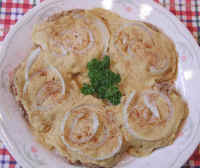 Place the plate of un-cheese crumpets in the microwave oven and cook on "high" until the un-cheese sauce becomes firm and the onions are cooked. The five halves on the plate in the photo took about 2-1/2 minutes. Garnish with a sprig or two of parsley, serve and enjoy!